Sen. John McCain picked up another big endorsement Wednesday. 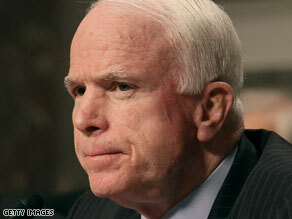 Washington (CNN) – Arizona Sen. John McCain picked up his second high profile endorsement in as many days Wednesday. A day after Americans for Tax Reform president Grover Norquist lined up behind McCain, the Arizona Republican Congressional delegation announced Wednesday it too will support the four-term senator. "It's an honor to serve with my friend John McCain in the United States Senate and I believe he is the right man at the right time to represent Arizona's conservative values in Washington," said Senate Republican Whip Jon Kyl in a statement. Reps. Jeff Flake, Trent Franks and John Shadegg also added their support in the statement released by the McCain campaign. Among McCain's challengers in the Arizona primary is talk show host J.D. Hayworth, a former Arizona congressman. Chris Simcox, a co-founder of the Minuteman movement, is also challenging McCain. ...why is everyone supporting McCain? He's a good guy, but he supported government spending. We need a fiscal conservative. The Obama administration needs to stop spending money that isn't theirs. I endorse any dogcatcher to be Senator of Arizona to replace inept pilot, John (cheat on crippled wife for money) McCain. The GOPers just want him re-elected because they're afraid we're going to go back to the old-school filibuster rules where someone has to stand up in front of the Senate and keep talking without bathroom breaks, etc. They figure since McCain's already wearing the pampers, he'll be perfect for reading us the phone book while Rome burns. haven't we seen enought of the Maverick? not to mention him bringing Sara "Crib Notes" Palin into the spot-light. please do it for AMERICA! I want the McCain of 2000. He was at least a Republican I was willing to vote for. I blame John McCain for introducing that idiot, Palin to the country. I can't turn on my television without seeing her stupid face. And let's face it, the woman is dumb. When asked what her core values were, core meaning what she believes in her heart, she had to write them on her hand. I laughed my head off, because there are some people out there who actually think she could be president. First, you have to have a brain, unless you are George w. Bush, and daddy can get you in. Bring on the GOPailins, I've got news for them. She'll tank the party, like she tanked McCain's election. Wow nice to see you Republican eat your own, I thought Republican Dictorial take over is what you wanted. McCain will be Senator for as longs ashe wants the seat and nothing you Republicans or Democrats can do about it. Oh and by they way, McCain did not pick Palin, the Jesus freaks and Holy Rollers of the Republican party forced that dim wit on him. Remember all the threats "If McCain does not pick Palin as his ruunning mate, the Jesus freaks would vote Democrat". I won't endorse him, I'm rooting for the Democrat. Retire please. You are not the man that you were. You are a crabby negative old man. Well if we get old John back, at least the military will be kept busy; providing he gets his way; and it looks like the Tea Baggers are getting another comvert as the "Maverick" has gone totally RIGHT as has his boy Lindsay Graham. Ever since John McCain was caught with his hand in the cookie jar(Keating 5), I've despised him and never will trust him again. For crying out loud, look what he's done to this country. He's simple-minded, angry,senile and war hungry. Time to go John and take Mom with you. The sunset is waiting for you John, please ride off into it. Take the Alaskan Air Head with you. How's that mavericky thing working for you now John? why does mccain need endorsement from all these "high-profilers"? doesn't he have a "higher" profile than all the losers that are endorsing him? I will not vote for Senetor MCcain again. the 1900s are gone. So should he. I just think he has spent too much time in the Senate. He is a patriot. I think he just should not serve anymore. NEW IDEAS PLEASE AND NOT JUST FROM THE CONSERVATIVE SIDE. JD Hayworth is a slimy self serving scumbag. He makes Cheney look like a boyscout. McCain will have my vote come election time.